The “Frying Pan” is one of the larger rooms on the second floor. The room got its name because of the large bay windows that face east, which heats the room in the morning when the sun rises. 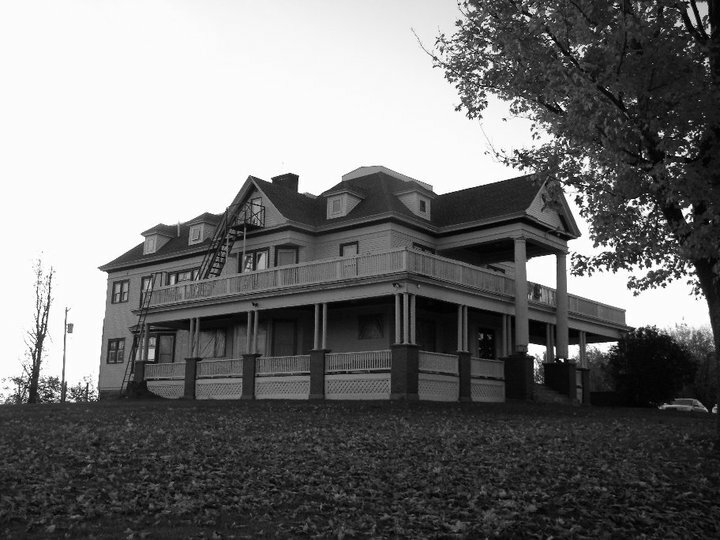 The “Frying Pan” is also home to one of the ghosts of the house, The White Lady. As the story goes, the Sissons were a very wealthy family and they wanted their wealth to remain in the family. The problem was that at the time, the only one eligible to marry was the daughter. A prearranged marriage was set up. The daughter threatened to run away because she was against being married. The night preceding her marriage she was confined to her room so that she could not run away. The next morning she was found dead wearing her bridal gown; she had hung herself in her own closet. As the years passed the house became the home of the Lambda Phi Epsilon brothers, but she still remained. Many of the brothers have seen the “White Lady.” Even the dogs can sense the presence of the ghost; sometimes the dogs will bark at the closet where she hung herself in. Also the door to the closet does not remain shut. When the brothers shut the door somehow the door always opens back up. One day somebody put a cinder block in front of the door and the door still managed to open itself. Because of this problem the door has been removed from the hinges so that no one will have to fight with the door again. The closet is now a bunk bed where up to two brothers sleep in the same location where the “White Lady” hung herself. The other ghost of the house is Otis and his story originates from the “Chancellors Suite.” The Chancellor, or current leader, of the fraternity stays in the Chancellors Suite. This room is rather large and has its own private bathroom. Otis was the Sisson’s servant. One day Otis was working in the tunnels that connected the mansion to the village of Potsdam, and unfortunately the tunnel collapsed on him. The Sisson’s found him alive and since they knew he was going to die they kindly offered anything that he wished. Otis’ wish was to live as if he were a Sisson. Keeping true to their word, the Sisson’s allowed Otis to stay in the Chancellors Suite for his last few days. Before passing away Otis thanked the Sisson’s and said that he would stick around in spirit and protect them. To this day Otis’ spirit still has a strong presence around the house. Otis is an active ghost. He is the one that gets blamed for the countless harmless events that take place around the mansion. Often there is a brother that is going to his room with his hands full and their bedroom door seems to mysteriously open. Sometimes the sounds of people playing pool downstairs are heard from the upper floors. When a brother goes downstairs the lights will be off, no one will be present and the pool balls will be rolling. Otis is the only to blame for this. The Lambda Phi Epsilon mansion also has many children ghosts that are in the house. The Sissons were a very wealthy family and they did not want their money to end up with another family. Thus, they often married within the family to keep their money safe. Due to this intermarrying some of the children were born with birth defects. Unfortunately the Sissons neglected these children and left them in the basement. These children would wander around and play in the basement until their death. Many years later the spirits of the children remain. Often the sound of a bouncing ball is heard under the stairs. Sometimes a quiet voice is heard whispering saying “come play with me”. These ghosts are rarely seen, but their presence is greatly felt. You can see an article by clicking here that explains a little more about how haunted our house really is.